Dr. Garceau can create customized fittings of crowns, bridges, inlays, onlays, and other dental restorations using Computer-Aided Design (CAD) and Computer-Aided Manufacturing (CAM). 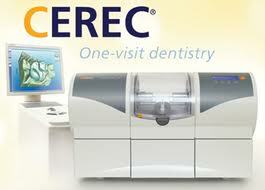 Through the CAD/CAM technology, she can provide you with the most precise restorations possible. By using CAD/CAM, Dr. Garceau is able to create durable, well-fitting, individual or multiple-tooth restorations. CAD/CAM technology also delivers advantages when it comes to office visits. Traditional tooth restorations may take several days and multiple office visits, but with CAD/CAM technology, we are able to perform single-visit tooth restorations! In just one visit you can have a beautiful, healthy smile. To learn more about CAD/CAM technology and how it can benefit you, please contact our office and schedule an appointment with Dr. Garceau. Laser therapy in dentistry provides patients with a more comfortable dental treatment experience. Using laser dentistry, Dr. Garceau is able to deliver a precise treatment that is more comfortable, quicker, and provides more stunning results.